Continuing our month of NATURE at MAKE MY MONDAY, this week we would like to see Animals. Any size, pet or wild, the choice is yours. Please rememebr this is not a samping challenge so you could use any of your CD's or decoupage sheets to make a card. Also any form of a project is acceptable, a card, a tag, a scrapbook LO. Please check the rules on the challenge blog. Also the remainder of the team, have some really cute animals for you to see. I look forward to visiting you to see your animal choices. 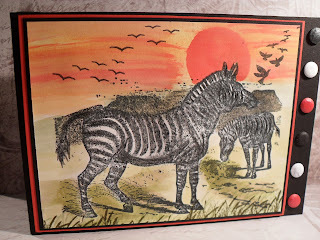 I was fortunate some time ago to buy 4 x La Blanche stamps of African animals, I decided to stamp the Zebras for this challenge. All of the colouring was completed using several TH Distress inks as watercolours. I stamped the Zebras first onto white card. The watercolour technique I use is achieved by, stamping your chosen colour either onto a white tile or an acrylic stamping block with a piee of white paper underneath, which helps you to see the ink on the see through block. I use a large brush, spritz some water onto the ink. I then covered all the lower area, below the hills with Peeled paint, the mountains with Frayed Burlap, the foreground with Bundled Sage, the grass was stamped with Forest Moss, using some grass stamps I bought on E Bay. Once dry I then re-painted some areas to give more shading. The sky was first watercoloured with Mustard Seed, dried, then Dried Marigold, at this stage I made a circle template, punching out a circle onto a piece of card, plced over where I needed it. Stamped the top part of the Zebra's head onto a post it note, covered the area within the sun. I then used Barn Door, less diluted than the previous areas, to paint the reddish sun. removed the mask and template. Once dry, I added more water to the Barn door and smeared the sky. I allowed this to dry then brushed over all of the sky with clear water to dilute over strong colours. the birds stamped when dry, are from Inkylicious.I have added the details of how I achieved the background, as requested by craft a scene, I hadn't originally for I thought it ight be just a bit too much information to read, however, I realise there are some who may be wondering. I am also entering this card into Craft-a-Scene, I don't know whether it will be okay for sadly I don't have any Scenescape stamps which is their main aim. Crafty Anne's Challenge Blog - Let's Think Hot! This is a fab card and absolutely perfect for our challenge at Crafty Ann's - thank you for joining us. Fabulous image and great colours used. Hi Caz, I adore the colours on your card and those are really gorgeous stamps. I entered the Craft a scene challenge without any Scenescapes and it was ok! I've had some lovely words of encouragement from them too. What an incredible scene! Love how you've done your background! Thanks for playing along with us at Craft A Scene! An absolutely wonderful card Caz. The scene is absolutely gorgeous and done so well it's very realistic. A fantastic scene Caz, so beautifully put together. Caz, that's a fabulous scene, love the colors. Love this scene,beautiful sunset and awesome animals. Morning Caz, fabulous animal card love the Zebra. Wow, this is a great card! Love all the info you gave to us, so much to learn! This is fabulous - love your watercolour technique. Thanks for explaining the background! Soon as I get some DI I'll try it! I too, entered the Craft a Scene challenge without using a Stampscape stamp! absolutley gorgeous!!!!! Thanks for joing us at Craft A Scene! !